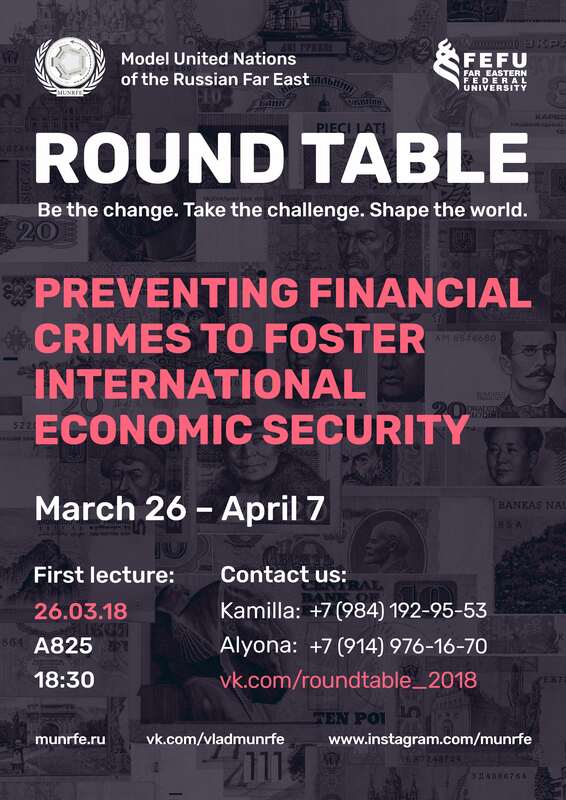 MUNRFE Vladivostok Club Round Table 2018 "Preventing financial crimes to foster international economic security"
From March 26 to April 7, 2018, MUNRFE Vladivostok Club will conduct the Round Table 2018, where students of the Far Eastern Federal University (FEFU) will examine current issues and problems of the topic – Preventing financial crimes to foster international economic security. Program of the event includes a set of lectures and trainings aimed at specific features of national economic policies of all countries around the world in order to promote International Financial Relations and the role of the United Nations in the Global Development. Moreover, students will have the opportunity to improve their skills related to public speaking, learn more about the art of debate and decision-making process. During two weeks participants will be attending the lectures of FEFU professors specializing in the World Economy, as well as experienced members of MUNRFE, who have represented the Organization abroad at International MUN Conferences in New York, Tokyo, Jakarta, Seoul, Moscow and other cities around the world. The first lecture will be held on March 26, at 18:30, in aud. A825 of the Far Eastern Federal University Campus. Model United Nations of the Russian Far East jointly with Far Eastern Federal University will organize Earth Hour 2018 which is to be held on March 24 in FEFU, A building, 4th floor, “Ajax”, 7:30 p.m.
Earth Hour is a global movement that unites millions of people around the world, who are ready to save our planet. The key aspect of Earth Hour is that people turn off the lights in their houses or workplaces to demonstrate their respect for Earth and acknowledge others about serious environmental problems. For the second time young leaders of MUNRFE Vladivostok Club will become organizers of Earth Hour in the University, having a great wish to involve all FEFU students in global movement and spread the information about the importance of environmental issues. 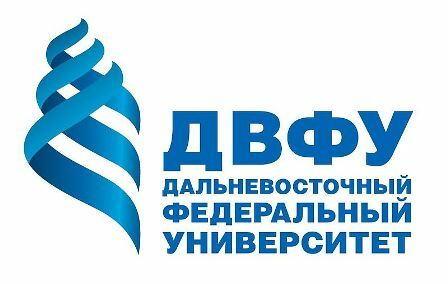 Model United Nations on the Russian Far East is glad to announce that the Grant Competition for the participation in the Far Eastern Model UN 2018 is prolonged till March 31. 2. Free accommodation during the Conference at FEFU Hotel Complex (4 nights). -to prepare the Essay on one of FEMUN 2018 agenda items where the candidate should express his/her knowledge on the main topic of the Committee, alluding to the official documents adopted by the United Nations as well as other international organizations. On March 10 Blagoveshchensk Club successfully conducted the final debates of Spring MUNRFE School. The participants of the School discussed the agenda item "Situation in Afghanistan: the threat of terrorist groups for countries of the Middle East" in frames of the UN Security Council. During the final event delegates showed their public speaking skills and knowledge obtained at the project as well as fully expressed their desire to negotiate and cooperate. 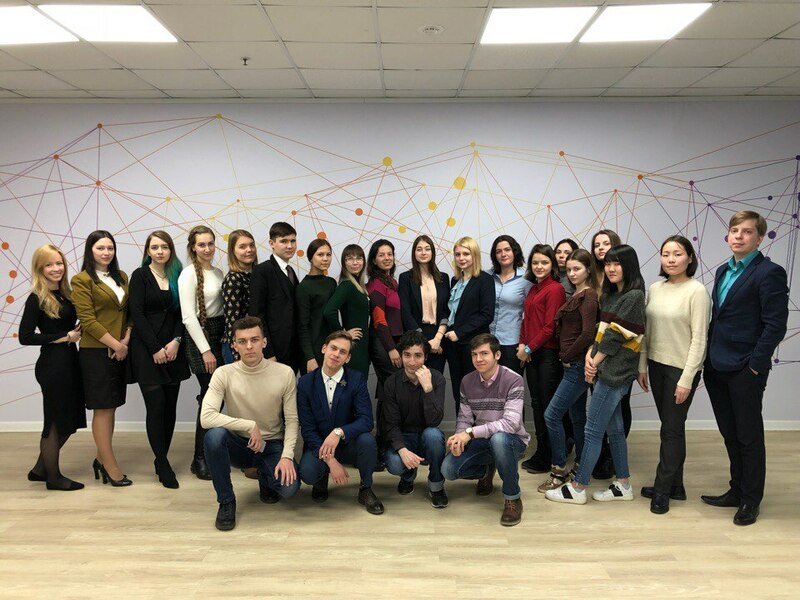 The School was launched on February 26 when more than 20 university and schools students joined the open presentation of the project in Amur State University. During the project its participants had an opportunity to invest in their self-development and, in particular, to develop their public speaking skills and widen leadership capacities. Performing as lecturers members of the Club also shared their knowledge in the United Nations structure, goal-setting and principles of the negotiation process with the participants of the School. On February 22, 2018 the presentation of “FireStarter 2018” was conducted in the city of Belogorsk, Amur Region. 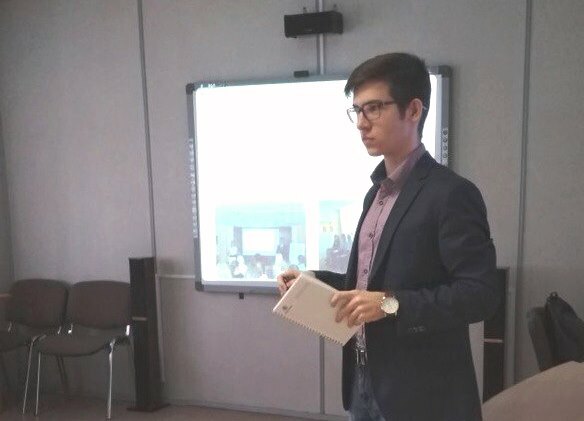 The presentation took place at the local Center of Education and it gathered more than 20 young leaders interested in their personal development and improving the world around. 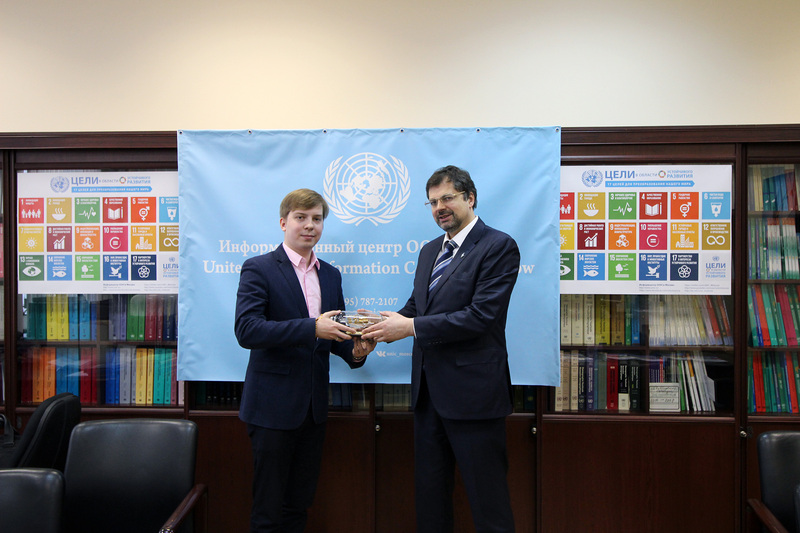 MUNRFE Vladivostok Club member Mr. Vsevolod Cheresov in frames of the presentation of the project provided young leaders with an interactive lecture on the work of the United Nations, its goals and principles, values and commitments. It is notable that all attendants took an active part in the discussion showing knowledge on the topic and expressing their thoughts and ideas. They watched an inspiring video about the Sustainable Development Goals. On February 26 MUNRFE Vladivostok Club had one of the most important events for the entire MUNRFE which is the Presidential Elections. 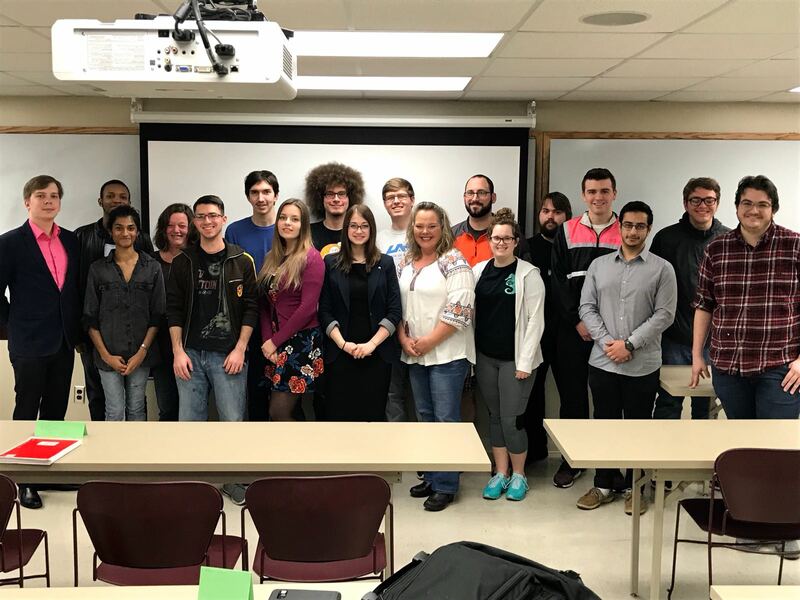 Since only one Presidential Statement was submitted by Club’s former President Ms. Anna Timokhina, she introduced her Program of work to the Club. After the presentation, there was an active discussion between Club members and the candidate regarding further development of MUNRFE Vladivostok Club following with Q&A session. In accordance with the results of voting, Ms. Anna Timokhina was unanimously reelected for her second term of MUNRFE Vladivostok Club’s President. Moreover, Ms. Alexandra Kosyreva was appointed as a Vice-President for the second term as well. 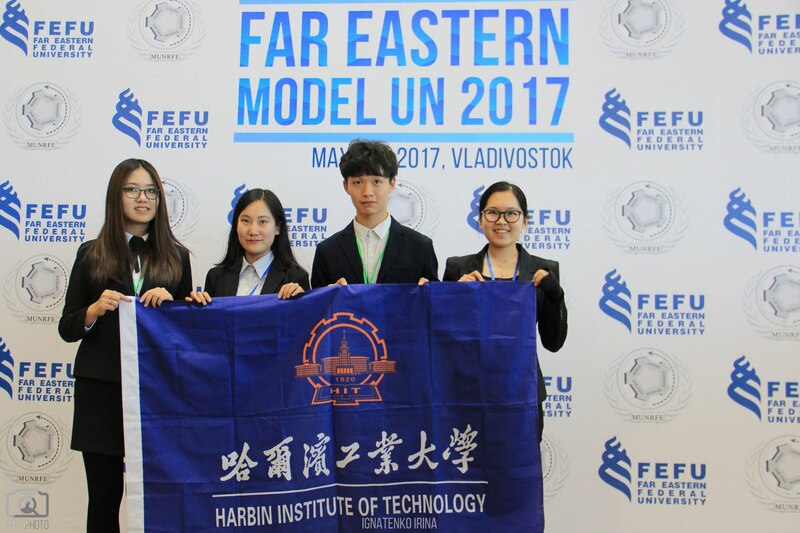 On 19 and 20 February 2018 MUNRFE officials got an exclusive opportunity to speak at the University of Alabama in Huntsville (UAH). This visit was arranged by MUNRFE Governing Council member Mr. Jesse Thomas, who is a 2012 UAH alumnus, and hosted by UAH Department of Political Sciences. Along with Mr. Thomas three other members of the Organization, namely the Governing Council Chairman Mr. Vitaly Savenkov, Governing Council member Ms. Ksenia Shevtsova, and Vladivostok Club Vice-President Ms. Alexandra Kosyreva, addressed UAH undergraduate students on both domestic issues in Russia and bilateral relations of Russia and the US. In course of their business trip to Moscow and New York, MUNRFE Governing Council Chairperson Mr. Vitaly Savenkov and Vladivostok Club Vice-President Ms. Alexandra Kosyreva had an opportunity to broaden MUNRFE connections with the United Nations Department of Public Information. On 5 February Mr. Vitaly Savenkov visited the United Nations Information Centre in Moscow, where he had a meeting with its Director Mr. Vladimir Kuznetsov, along with UNIC National Information Officer Mr. Vladimir Pavinskiy, UNIC Team Assistant Ms. Irina Gadzhieva and Churkin International Model UN representative Mr. Akop Torosyan. 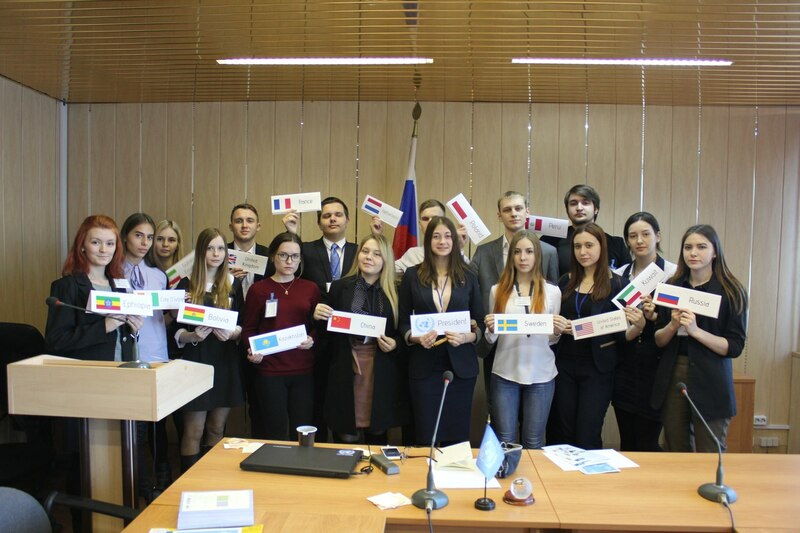 The parties had extensive negotiations about promotion of the UN-related activities on the territory of Russia, including the Russian Far East, and cooperation in the sphere of Model UN. Overall, both MUNRFE and UNIC expressed sincere interest in activities of each other, thus the actual cooperation is expected to begin later this year. In autumn 2017 the ASEAN Centre in MGIMO University and the ASEAN Moscow Committee conducted the Essay Writing Competition dedicated to the theme “ASEAN at 50: Achievements, Challenges and New Opportunities for Cooperation with Russia”. According to the results of the contest, MUNRFE Executive Director Ms. Elena Kiseleva was recognized as one of the best essay authors and will be awarded with special gifts from the Embassies of ASEAN member states. 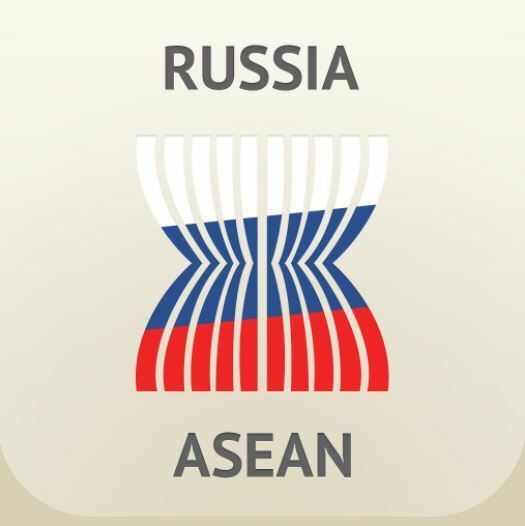 The competition was organized for students and young professionals from Russia and ASEAN member states who are interested in the history and contemporary developments of ASEAN-Russia relations. MUNRFE has always expressed its interest in ASEAN-related events, thus, the contest became a great opportunity for MUNRFE members to deepen and enhance their knowledge in the sphere of Russia-ASEAN cooperation and to explore the prospects for its development. It is a great pleasure for us to announce that the process of considering applications for one of the most spectacular events of this summer - "FireStarter 2018" - is about to start. 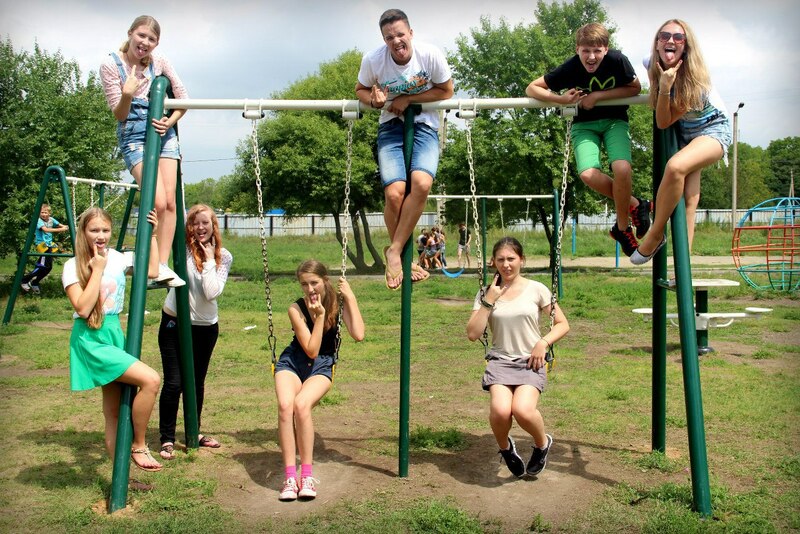 We are proud to have been implementing this Summer Program for more than 10 years, and so traditionally giving teens an amazing opportunity to boost their self-development, to realize some of the most daring ambitions, and most importantly, to fully immerse into the English speaking environment without flying miles away abroad or even leaving the Russian Far East. The Summer Program will gather young leaders from the entire region and will unite them for the period of two weeks to make long-lasting friendship. Participants of the Program will go through different lectures, trainings, and master classes aimed at acquiring and further developing such useful capacities as leadership, public speaking and the art of convincing others, debating skills, successful team-building, time management, ways of reaching new goals and heights, and many more.